When Rex Fury escapes from Albatross Island Prison, Mayor Gleeson calls on Chase McCain to recapture the ruthless criminal, bring him to justice, and put an end to the crime wave that has once again gripped LEGO City. As the heroic police officer that was responsible for capturing his nefarious nemesis the first time around, LEGO City Undercover sees detective McCain don many disguises to perform undercover jobs as he learns more about who is really behind the sudden crime spree. The first time that developer TT Fusion was allowed to stray away from movie and comic licenses, LEGO City Undercover remains to be one of the best games that I ever had the chance to play on the Wii U. And, as underappreciated as the console, I’m glad to see Chase has been allowed to make a welcome return on Nintendo Switch. With his undercover mission seeing him work closely with the criminal masterminds whose goons have been let loose on LEGO City, Chase receives support from the doughnut-loving Chief Dunby, greener-than-green rookie cop Frank Honey, and the ever-efficient Ellie Phillips who supplies him with police equipment when needed. It is the pun-packed script and comedic delivery from the voice actors that make LEGO City Undercover one of the most laughter-inducing games that you will have played in a long while. Whether that be Frank Honey’s unpredictable and dim-witted reactions to anything and everything, or the parodies that fleetingly throw references to The Shawshank Redemption, The Matrix, and Starsky & Hutch, writer Graham Goring sprinkles more than enough mirth throughout the adventure to always leave you wondering what rib-tickling joke you will be laughing at next. Bathed with a 70s-inspired vibe, that sees the player wander a world bursting with personality. 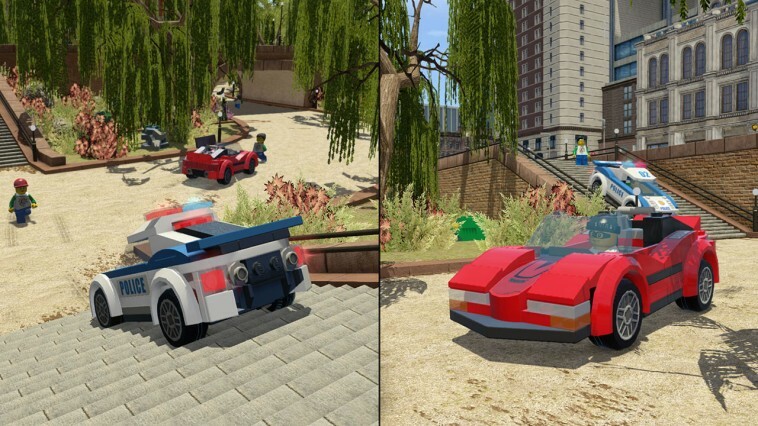 Whether you are downtown, on the beach, or at the airport, the bustling metropolis is filled with LEGO characters going about their daily lives with the player free to commandeer more than 100 vehicles – whether that be police cars, motorcycles, helicopters, or some that aren’t even worth spending time in. It’s easy to feel dwarfed by the open-world sandbox at times, especially in how long it takes to travel back and forth between story missions – but, when you spot one, you can hail a taxi or limousine to drive you to your next destination or hop on a train. It is the disguises that Chase can wear that allow him to use the skills that are usually shared between multiple characters in a standard LEGO adventure. As a police officer, Chase can arrest bad guys with handcuffs, hunt for clues by tracing footsteps, and use a grapple gun to swing across gaps, or he can use a crowbar to break open locked doors or use the colour gun to activate switches when dressed as a robber. And then, as other examples, the miner has a pickaxe to break boulders and explosives to blow up larger obstacles, the farmer can make plants grow using a watering can and launch eggs with chickens, and the fireman can hack doorways open with a fire axe and douse blazes with a fire extinguisher. 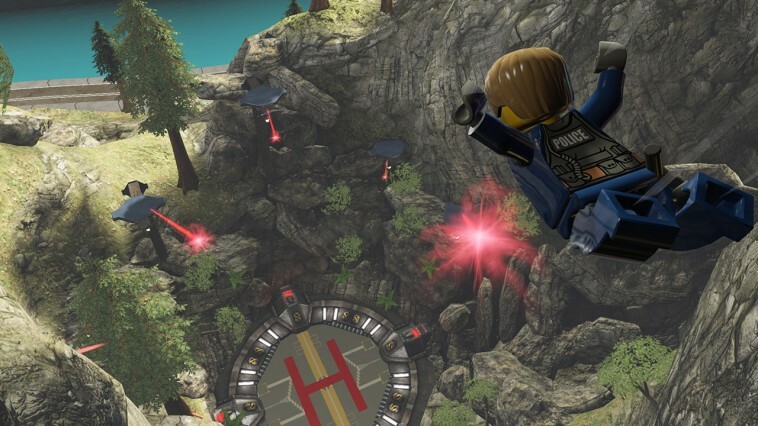 These gameplay mechanics are steadily unlocked as you continue the story and tread familiar ground for those that have enjoyed many a brick-tastic adventure before, but, now all accessed from one character, it not only simplifies the experience but the constant interactions with Chase help players get to know him more as the hero LEGO City deserves. 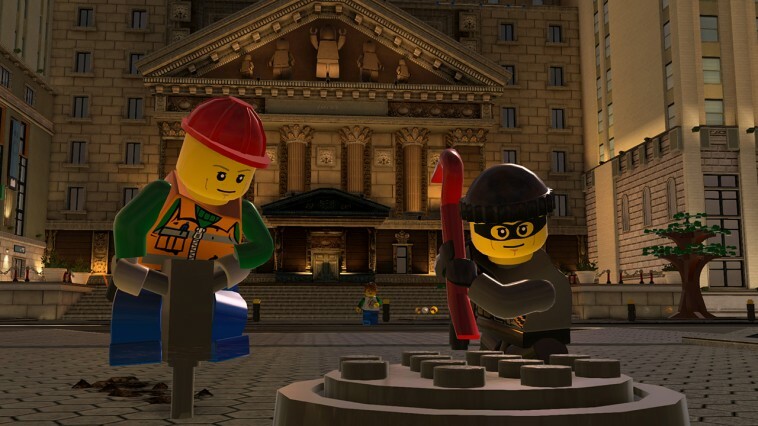 It won’t come as a surprise that your time with LEGO City Undercover will see you smashing everything that you can to collect studs, retrieving police badges, creating Super Builds, completing story missions, solving puzzles, and generally messing around in the game’s world. With the Wii U GamePad out of the picture, the interactions with that oversized controller have easily been consolidated into a single-screen experience – with the video calls, map-screen, and scanning all on the main TV screen. LEGO City Undercover is an imperfect port, however. There have been visual improvements but the experience is marred by an inconsistent framerate, bugs, and other quirks in animation. It’s a shame that these haven’t been ironed out as they were mostly present on Wii U, too. But, I think it’s important to remember how ambitious this game had been at the time, and that while their presence is always undesired, they are the result of that. The chance for a second player to join in and help to track down criminals was an exciting one, seeing as we never had that on Wii U. Unfortunately, this impacts on and worsens the performance issues, presumably coming from the fact that the open-world must be rendered twice. It’s admirable that they have added it, but it results in a wavering experience. Hilarious and entertaining, LEGO City Undercover will forever remain among my favourite LEGO games. Chase McCain’s return to the scene of the crime is a welcome one, but, as an inadvertent downside, it also shows how far the LEGO series has progressed in the last few years. Its crime-ridden world is still an absolute blast to be a part of, however, and I hope that we’ll have another chance to chase down criminals in the future.